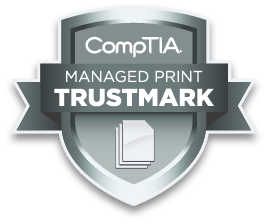 Managed Solutions Group has earned the highly respected CompTIA Managed Print Trustmark certification. What does this mean for your business? Document output is crucial for your business – but managing your fleet does not need to be a frustrating experience. Let Managed Solutions Group provide you with proactive services that include the latest technology in device monitoring and the support to go with it. Feel confident that when you hit print, there’ll soon be a physical copy of that document in your hands within a matter of seconds. That’s the beauty of Managed Print Services by Managed Solutions Group. Through our detailed print assessment, we’ll provide you with an analytical approach to understanding your entire print environment. Customized recommendations using measurable business results are shared to assist in evaluating output needs, pinpointing inefficiencies and boosting productivity. With Managed Solutions Group’s Managed Print Services, we provide custom solutions for all of your document output needs. As a leader in Managed Print Services we provide fully customized and cost effective solutions, utilizing our secure, innovative device monitoring software. Using fleet device information helps identify ways to maximize the potential of your current printing assets, reduce costs, save time, and proactively manage and maintain your fleet. The result is a healthy, efficient, and effective printing environment. When you sign up for Managed Print Services, you can put your printing hassles and frustration behind you. We take care of all your printer needs, so you don’t have to worry about fiddling with ink cartridges or fussy printers ever again - all you have to do is hit print.